It must be. Because I opened my eyes, and there she was. Lulu and my cup of coffee. Really, it’s such a small thing, and it completely sets me up for the day. I’m able to give 200% to our guests, and to the cameras, and to the sea. I’ve written about this before - but for crew and guides on SwimVacation, it’s imperative that we take care of one another. We each do so in different ways, but it’s the secret sauce to this whole shebang. Kerry caught these photos of me and Simon just gettin up this morning. I’ve got my Lulu Coffee in my tiny hatch, and yes, dear Simon is set up where he sleeps in the out of doors. We had a bit of a damp start, with gray, cool skies and leftover wet from the night’s drizzle. It was the kind of morning when you’d like to just wrap up in something cozy and have a second cup. But No Way Athenae! We are here to swim. 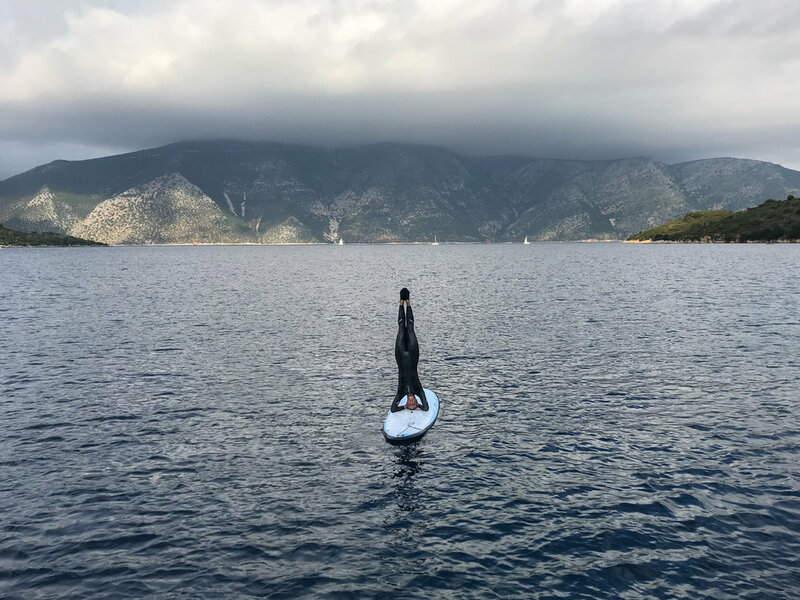 Mark and Marina hopped on stand up paddle boards - the bay of Skinos Beach on Ithaka was calm and flat and perfect for new paddlers - and the rest of us jumped in (except for Kerry who is nursing a bit of a cold….I think Ouzo is good for that…). Simon and Katherine went long and strong and made it all the way around the point to the outside, where they were wowed by huge cliffs cascading into a rough sea. They frolicked in the surf before heading back for a total of over 2 miles. Natalie, Susie and I traveled about 3/4 of a mile, oohed and ahhed at the limestone ledges, looked for new fish species (spotted a few!) and mostly just drank it all in. We topped out at 1.5 miles on arrival to the yacht. The underwater landscape here is so sculptural. 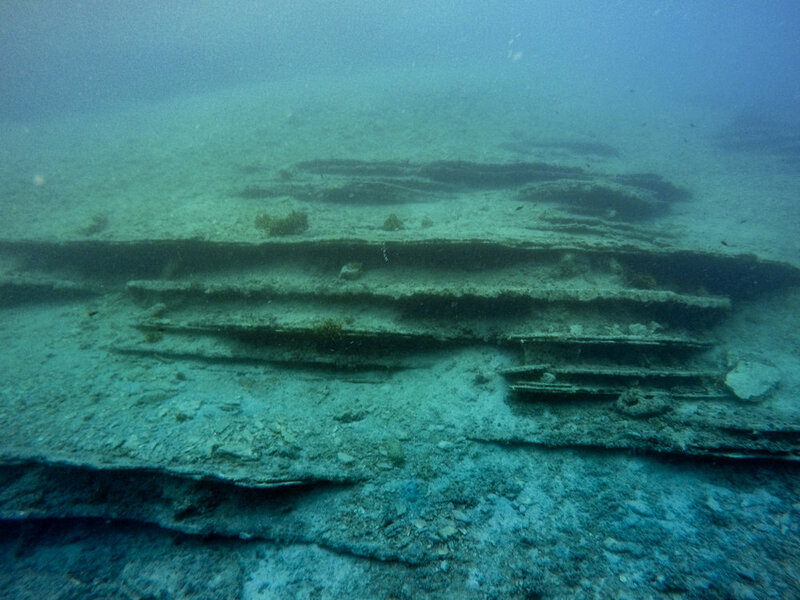 The limestone ledges we see above water - like white dominoes collapsed onto one another, continue underwater. Sometimes they fall flat and form tiered ledges and loges like an underwater amphitheater. Cue the Greek submarine chorus. I wonder if these formations inspired Greece’s earliest architects. Mixed in with the rock work are large patches of turtle grasses - deep greens with white frostings of limestone dust, Poseidon’s hair, a bit salt and peppered. It’s like nowhere else. Marina took the bay by SUP, stopping to chat with few local fisherman who reported the fish were being “sneaky”. Lulu is always waiting for us when we swim back to the boat. She and Richie are taking exceptional care of us this week. Katharine was upside down over her long swim with Simon. 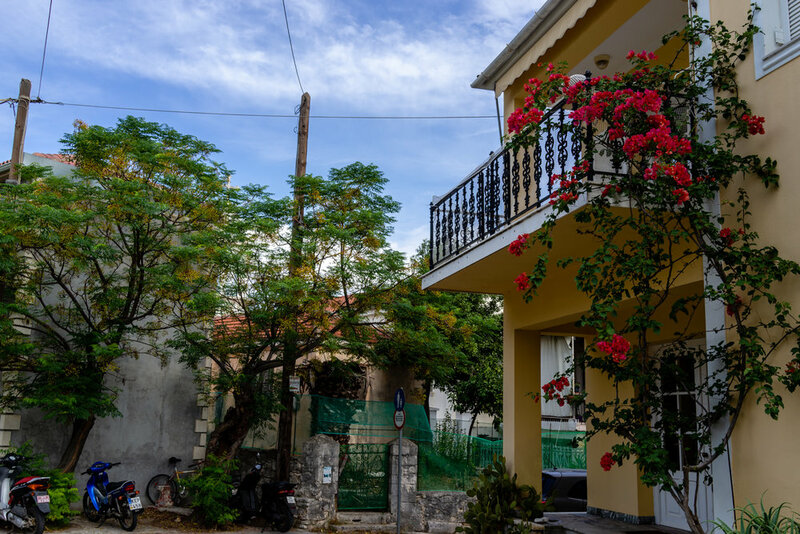 We needed to refill our water tanks, and everyone wanted a land excursion, so we sailed around to Vathy - an adorable Greek Seaside town. We said go play, you water people, and everyone took off for an hour and a half. Some provisioning, some souvenirs, and we reboarded to cast off again. Vathy. Don’t you want to go? We had a bumpy sail into the wind, everyone up top or out on the bow, Simon the most brave among them, riding the waves on the very front of the boat. He flew into the air on several pitches, and everyone was soaked by a splash that came up through the trampoline and spared none. I was safely in the salon editing, but a premonition told me to pick up my camera and I managed to catch the excitement. We finally pulled into a deep, narrow bay out of the wind. Filiatro, as it’s called, was picturesque with one resort-y looking beach and another long white, empty one. We plotted a swim into the wind to the point, then turning to circumnavigate the bay. There was something about this place. Something special. Natalie - all she does is swim with an eye to climb - actually got me, an aquatic mammal to scale a rock unto a lovely ledge. What?? I know! But it was so beautiful I couldn’t help it. As she said yesterday, “I had to do it!”. Oh pish posh I didn’t climb high, fish out of water and all that. But I did climb up and leap back in. Like two children we were. It was an energizing swim. There were no dolphins or other crazy wildlife sightings, no rainbows or anything like that. Just an entire course of spectacular scenery. Sometimes the water was gin clear, sometimes it was milky white. Deep greens on the sculpted white cliff tops, plunging walls to white sand beneath, some caves and stone towers underwater leading to the abandoned beach full of the most smooth and rounded white rocks you could imagine. 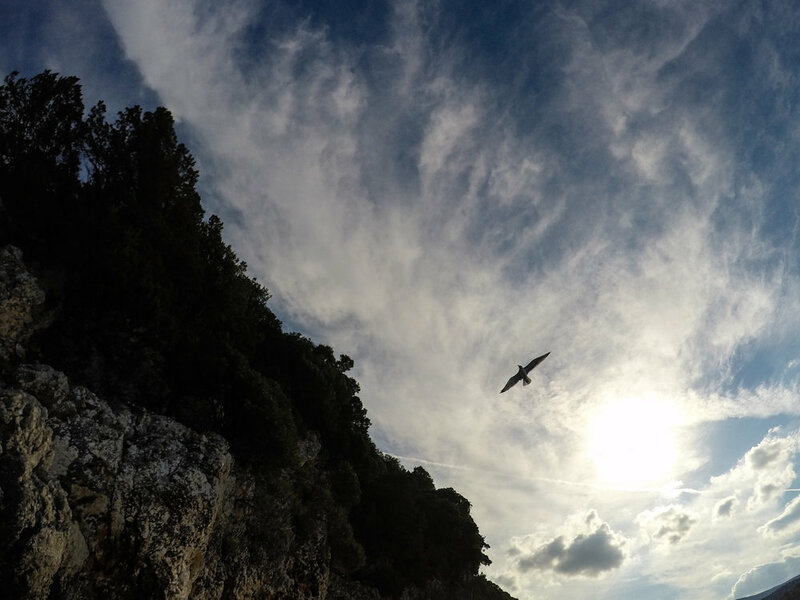 Goats were on the cliffs here, staring at us as if we’d lost our minds. I think perhaps we had. We were giddy. We all felt it. Just a complete natural joy, fed by a vivid, visual feast. We swam high from it for a mile. This place is infectious. 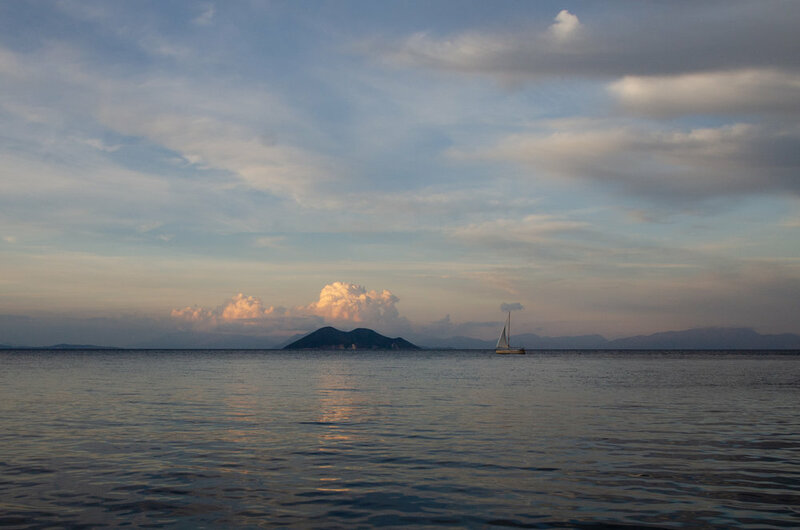 The food, the scenery, the especially salty Mediterranean Sea. I think it’s taking hold of me. So now I’m tucked into my little cabin bunk, listening to the sound of the waves on the shores of Gidaki Beach, our anchorage for the night. It looked about like heaven when we pulled in just before dusk. All white cliffs and turquoise waters and soft pastel sky. We’ll swim here in the morning (I imagine Natalie will climb) and see what spell it casts on us. Kalinychta (καληνυχτα) Greece, thanks for today. I’m falling hard for your Siren’s song.